The word hyperesthesia means increased sensitivity to touch, and this perfectly describes a unique disorder in felines known as feline hyperesthesia syndrome. Other names for the condition include twitchy cat syndrome, twitch-skin syndrome, and self-mutilating syndrome. Feline hyperesthesia is a somewhat mysterious condition characterised by bizarre behaviour which may include: rippling skin along the back, sudden bouts of frantic biting and licking at the tail, pelvis or flank, eyes wide open, dilated pupils and aggression. During an attack, your cat will behave as if he is reacting to hallucinatory stimuli. Feline hyperesthesia syndrome is still rather poorly understood. The condition appears to start in early adulthood, and there is a higher incidence in Siamese, although it can develop in any cat. Sensitivity to touch, especially along the spine, which may induce aggression. Severe cases of FHS may include self-mutilating by biting, licking and pulling out the hair on the back and tail. The cause of feline hyperesthesia syndrome still isn’t entirely known. 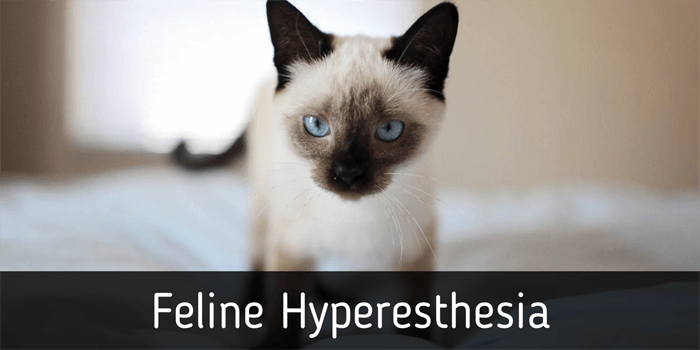 One hypothesis is that feline hyperesthesia syndrome is a form of seizures, while others believe it is a form of obsessive-compulsive disorder. Other possible causes include neurological disorders, stress, and anxiety. There is no diagnostic test for feline hyperesthesia syndrome; diagnosis is based on eliminating other possible causes of the behaviour such as parasites, food allergies, hyperthyroidism, spinal diseases and other neurological disorders. If possible, record the number of attacks your cat experiences. Specific triggers may initiate an attack such as petting, grooming, contact with another cat. It is important to be aware of these cues and inform your veterinarian. If all other possible causes (listed above) are ruled out, your veterinarian can assume the cat is suffering from feline hyperesthesia syndrome. Reduce stress in the household, such as addressing in-fighting between household cats. Provide your cat with an enriching environment such as plenty of play to burn off energy. Give him own bed, food and water bowls, scratching post so that he doesn’t have to share with other pets. Provide your cat with a routine such as feeding at the same time every day. Also, cats prefer several small meals are better than one or two large meals. Avoid activities such as grooming or petting if your cat becomes aggressive. Anticonvulsant medications such as phenobarbital. It may take a little time to develop a suitable drug regime for your cat and his particular circumstances and will take several weeks before you begin to see an improvement.